His mask got busted an' it made it hard to breathe. That'd scare the bad guys he was fixin' to hunt. 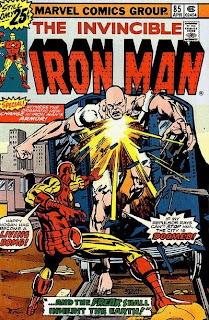 Okay, Ol' Groove might not win any Grammys for that ditty, but hey--it's no sillier than the true story behind Iron Man's infamous nose (Iron Man #'s 68-85). 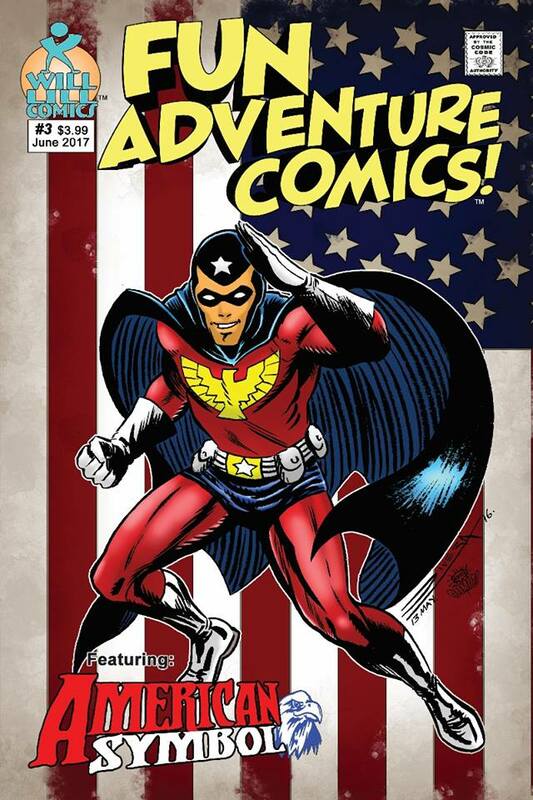 In 1974, Roy Thomas was Marvel's Editor-In-Chief, while Publisher Stan Lee was winging his way all over the country speaking at colleges and making deals with Hollywood types. Stan had pretty much left the day-to-day grind at Marvel in Roy's capable hands. 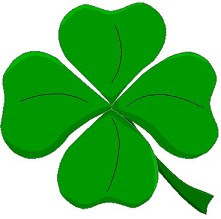 Got all'a that? Good, 'cause here's where it gets interesting. The story goes that one day, Stan bopped into the Bullpen and took a look at the art for the latest issue of Iron Man. 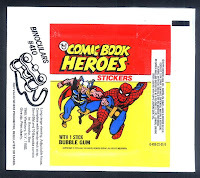 Evidently, there was a panel or two that showed the Golden Avenger's profile, and Stan, thinking the profile looked too flat for a human face to actually fit under wondered aloud, "Where's Iron Man's nose?" Somebody heard The Man utter that fateful phrase, took it to mean that Stan wanted a nose added to Iron Man's helmet, and viola! 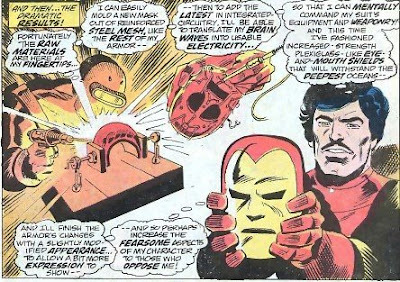 Mike Friedrich and George Tuska whipped up a story that explained, ever so melodramatically, the addition of a nose to Iron Man's helmet. As luck would have it, our hero wound up with a triangle sticking out of the front of his helmet just in time to pose for his first action figure from the folks from Mego. But that's not all! Months later, Stan was back for another visit to the Bullpen. Evidently he hadn't looked at an ish of Iron Man since his last visit, and when he saw that nose, THAT NOSE sent Smiley into a tizzy. 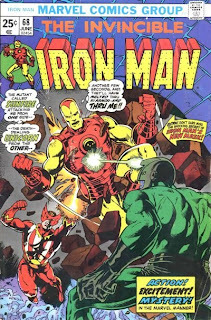 Word came down from on high that the nose had to go, so in Iron Man #85, Len Wein, Roger Slifer, Herb Trimpe, and Marie Severin concocted a tale in which Tony Stark built a new armored suit. This new suit was a quick-change rig that, at the touch of a button, would pop out transformer-like from the chestplate, gloves, and boots, sliding up, down, and across Stark's body to encase him in the familiar golden garb. However, a big triangular nose slowed down (held up?) the quick-change, so it had to go. Thank goodness. 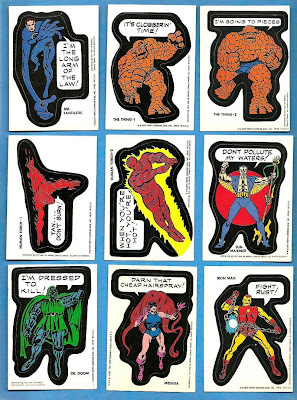 Marvel really blew it with that nose. 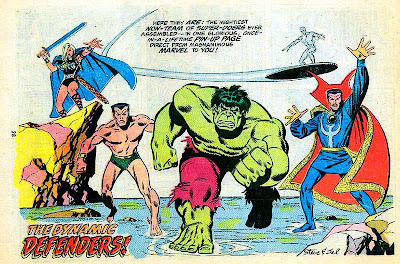 While he didn't receive the critical acclaim of his late brother, John, Silvio "Sal" Buscema was (and still is) one of comics' greatest artists. 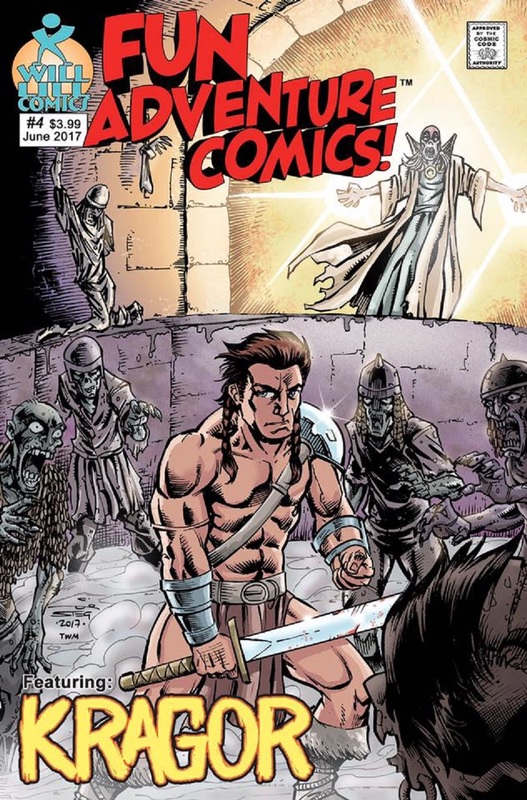 A master of storytelling, Sal's art crackled with energy reminiscent of Jack (King) Kirby, himself. His speed and dependability were legendary. If an artist missed a deadline, nine times out of ten, the job was saved by "Our Pal" Sal. 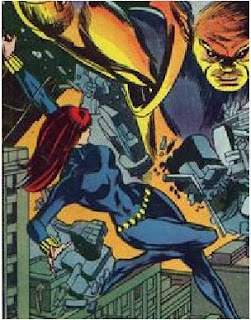 Because of this, Sal probably drew every Marvel character during the Groovy Age, whether it be in Marvel Team-Up, Marvel Two-In-One, or their own mag. 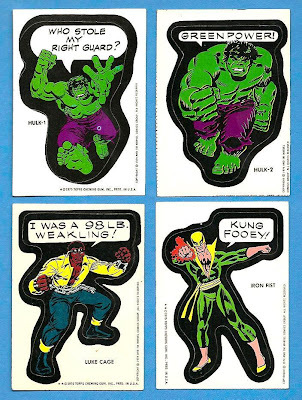 Sal Buscema was one of the reasons Ol' Groove got hooked on comics. 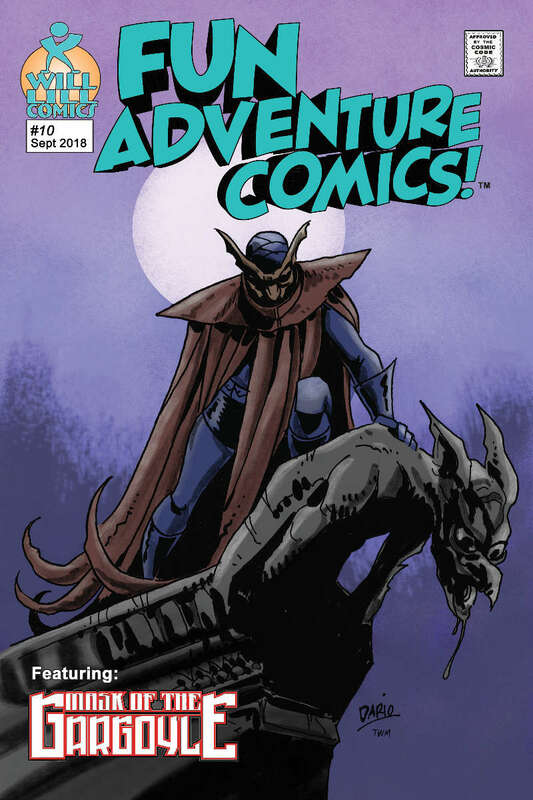 While Li'l Groove was picking up a comic here and there for most of his life, it was issues 88 and 89 of the Avengers that turned him onto the path of comicboo k fiend (at least, that's what his family and friends called him). 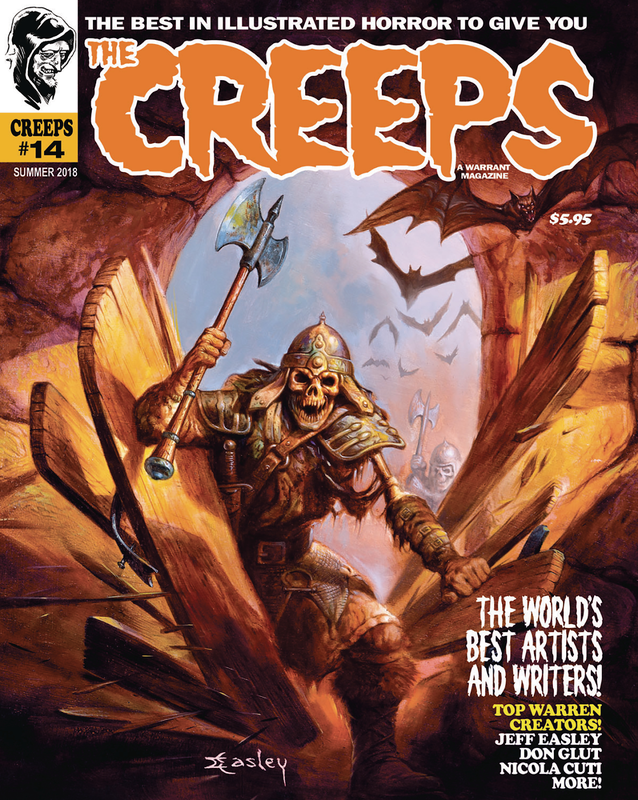 Those covers leapt out at me, grabbed me by the shirt and screamed, "Buy me!" --so I did. 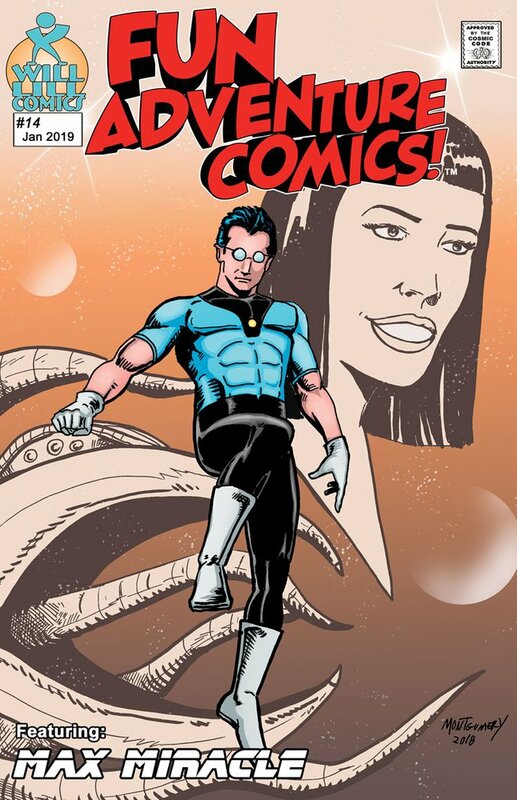 And from then on, I was never the same (hey--you just got the origin of the Groovy Agent--free of charge!). 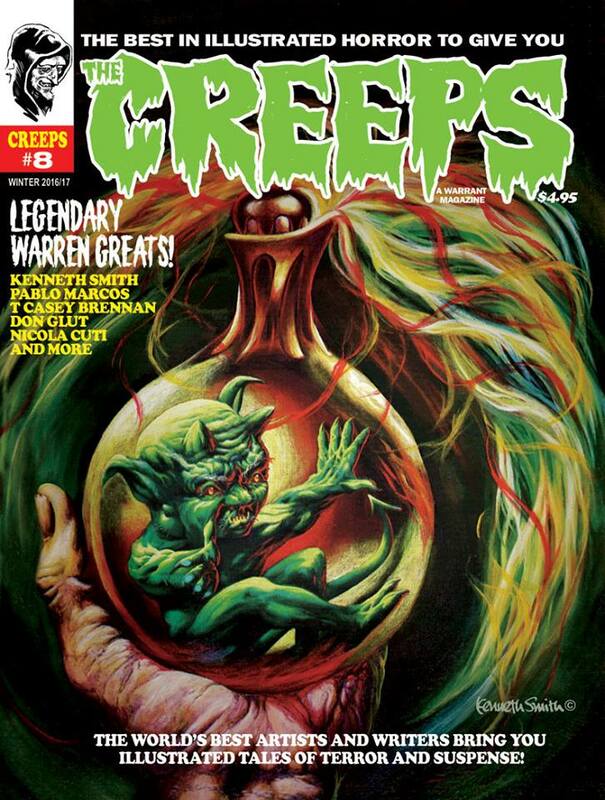 Soon, I found back issues (thanks to aunts and uncles with great taste in reading material) filled with Sal's work. 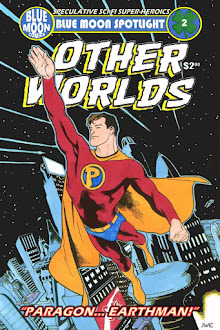 He had been drawing Sub-Mariner, inking Silver Surfer and Conan, and supplying covers galore (even for comics he rarely drew, like Iron Man and Daredevil). 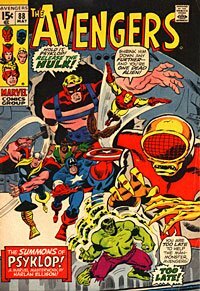 Before long, Sal was the regular artist on Captain America, my second favorite title (Avengers being the favorite, natch). From then on there was no separating me from anything Sal had a hand in. 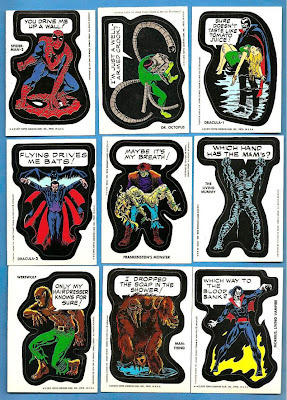 Defenders, the aforementioned Marvel Team-Up and Marvel Two-In-One, the Incredible Hulk, Skull the Slayer, Nova, Ms. Marvel, Spectacular Spider-Man, Tarzan, Rom: Spaceknight, and fill-ins galore. Though many times he was doing "breakdowns" (sparse layouts to indicate what was happening on the page to the "finisher" and/or inker), plus the fact that his style (especially when doing breakdowns) left him pretty much at the mercy of whomever was inking him, I could always depend on "Our Pal" to entertain me. 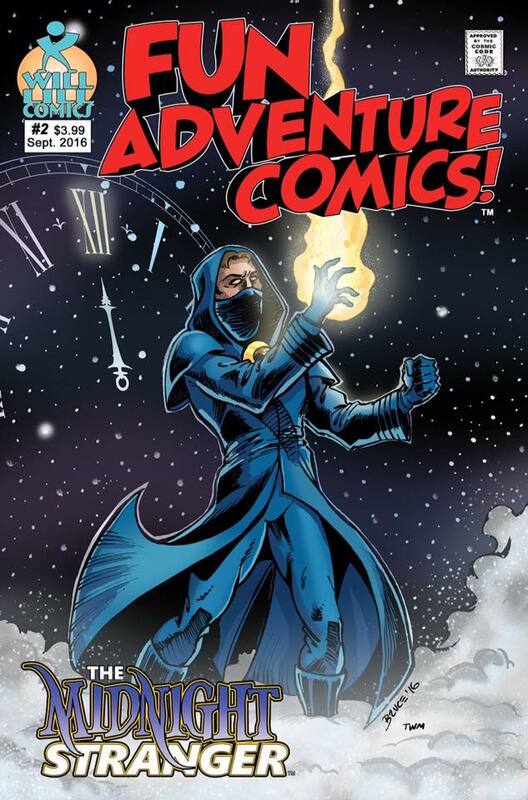 Whether it was groundbreaking superhero drama (his work with Steve Englehart on Captain America), all-out superheroics (Avengers, Nova) or superhero insanity (literally!--meaning his run with Steve Gerber on the Defenders), Sal packed every page with drama, action, and fun. 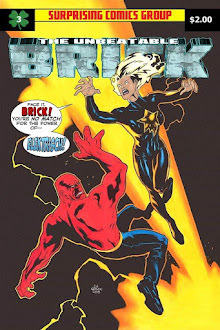 He still makes new fans and admirers even over two decades past the Groovy Age, mostly as an inker (on Spider-Girl). 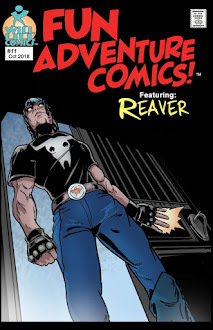 Sometimes, though, we get lucky and his powerful pencils pop up for a special story or cover. 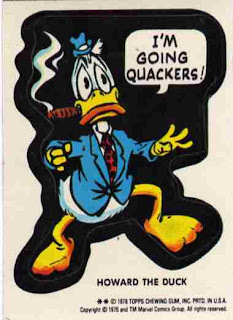 Mr. Buscemal has always stood for quality comics. Sal, we salute you, pal!! 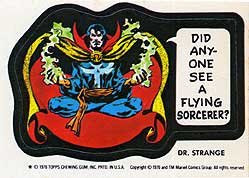 My admiration for the artistic skills of Jim Starlin knows no bounds. 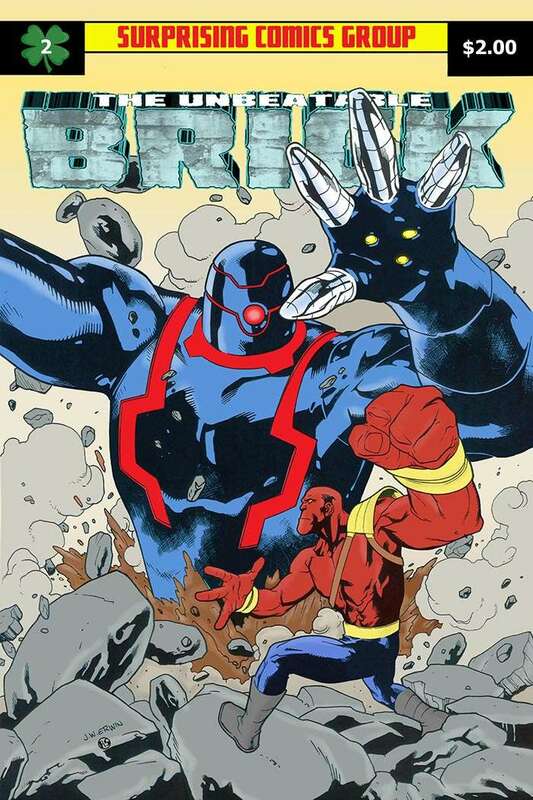 His work on Captain Marvel and Warlock (both in Strange Tales and Warlock's own mag) are the pinnacle of cosmic comics, Ol' Groove's favorite genre. 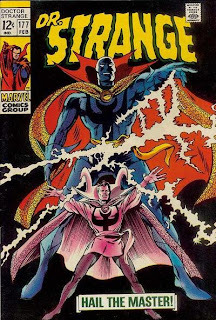 Starlin's cover for Strange Tales #179 (January, 1975) is one of the most awesome pieces I've ever seen. 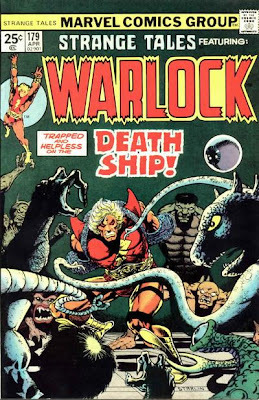 Adam Warlock is bound, but looks so determined and powerful it's obvious he's waaaaay more in control than that legion of funkadelic aliens would like to believe. Starlin's use of shadows and dark colors seem to almost shine a spotlight on our hero. 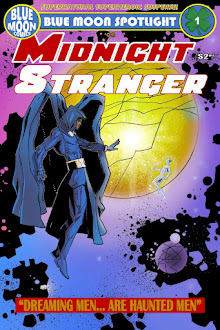 His imaginative aliens, part Ditko, part Kirby, and splashed with whatever else Starlin was into at the time are downright freaky-deaky! This is as far out as it gets. It's a masterpiece, I tell ya--a masterpiece! 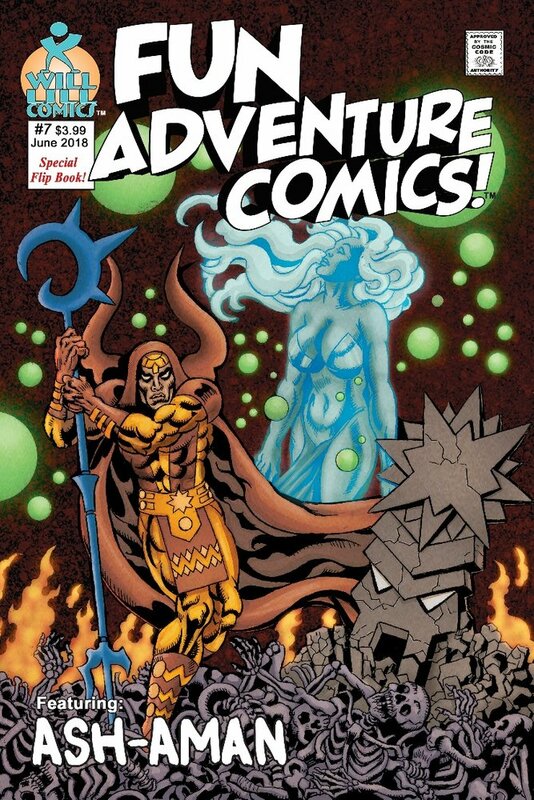 Topping it off is that "COSMIC Code Authority" stamp in place of the usual Comics Code Authority one. 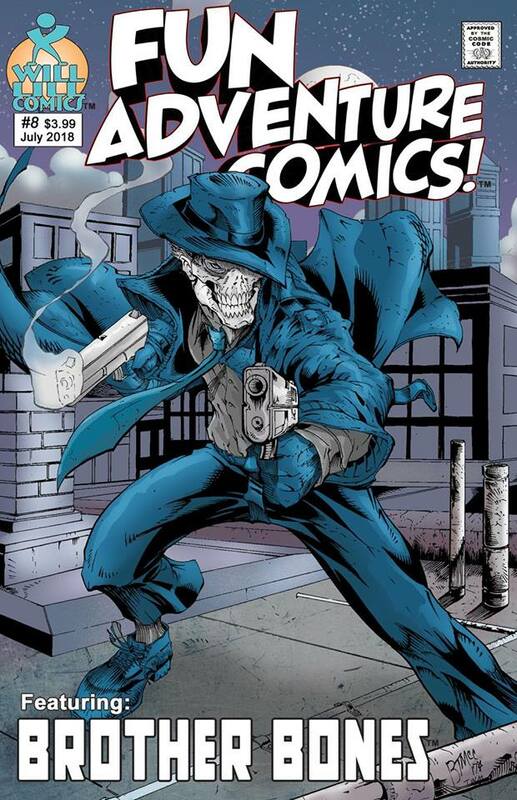 Man, this cover just totally blows my mind every time i see it. It's why they invented the word "awesome", man! Can you dig it? 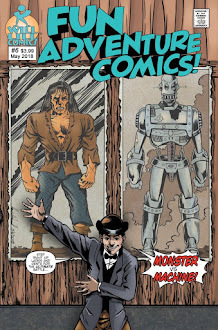 While the Groovy Age gave birth to many popular characters, you'd be hard-pressed to find one more popular than that midget-misfit mutant, Wolverine. 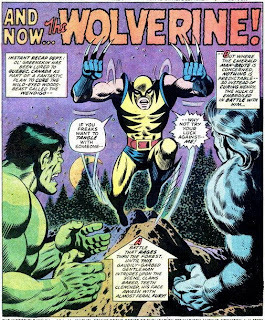 Created by Len Wein (who also gave us the Swamp Thing and the All-New, All-Different X-Men) and John (Ring-a-Ding) Romita, Wolverine first appeared as "The Wolverine" on the last page of the Incredible Hulk #180 (August, 1974). The claws, cool, and cockiness we came to know and love were all there in that pulse-pounding panel. We knew Wolvie was destined for greatness from the get-go! He was far-freakin'-out, baby! 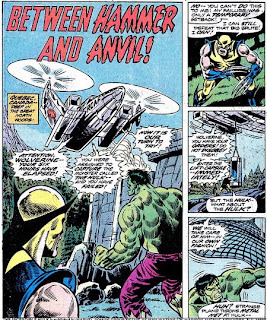 The first full-length appearance of the mutant we'd come to call Logan was in Incredible Hulk #181 (September, 1974, written by Wein with art by Herb Trimpe). Wolvie, that 5 foot 3 inch (or one, or two, or four or five, depending on who's writing the Who's Who entry) bundle of berserker rage took it to old Jade Jaws (and villain the Wendigo) like nobody's business. 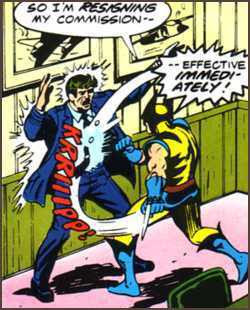 According to various interviews, Wein created Wolverine at the behest of then-editor-in-chief Roy Thomas. Wein says that Thomas wanted to see how Wein could handle a character with a Canadian accent. They then decided that the new hero should be based on an animal, since animal-based heroes usually sold well. 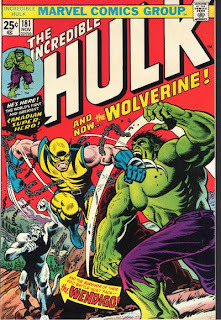 Since wolverines were dangerous creatures who would fight other animals no matter what their size, Thomas and Wein figured a wolverine would make a perfect antagonist to take on the gigantic Hulk. 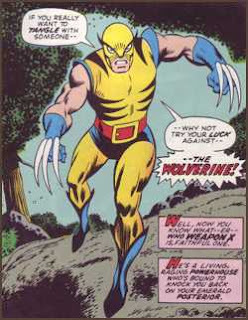 Thomas approved Wein's proposal, Romita began working on Wolverine's costume, and Wein started coming up with Wolvie's back-story. 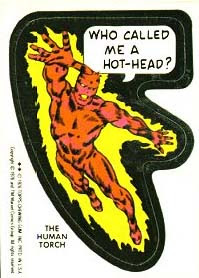 Wein had many cool ideas in mind for Wolverine like, yes, he was a mutant, but he was to have been a wolverine mutated to human form by the High Evolutionary. 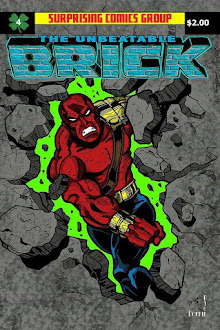 His powers were his healing factor, heightened senses, and berserker fighting fury. 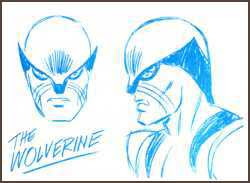 The claws were originally conceived as being part of the gloves, not part of Wolvie. They simply telescoped in and out of the casings on the back of Logan's gloves. 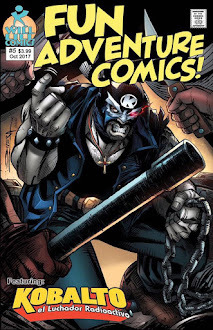 (The "...yer claws are a part of ye, laddie", along with the adamantium skeleton scenes were long-time X-Men writer Chris Claremont's flourishes added later.) Finally, Wein created Wolverine as a teen super-hero so he'd fit into the new X-Men line-up. It wasn't until All-New, All-Different X-Men artist/co-creator Dave Cockrum drew Wolverine with his mask off (X-Men Vol. 1, #98), that we learned Logan, as he was being called by that time, was actually much older than his peers at Xavier's. 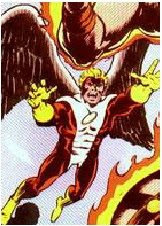 All-in-all, Wein and Romita created a sensation, whose history, personality, and coolness factor was built upon by other great creators like Claremont, Cockrum, and John Byrne. Thanks, dudes! That was the last time you'd see Wolvie playing the good soldier, man! Next time he was given orders it was cuttin' ties--literally and symbolically! Nowadays, costume changes are a dime a dozen. 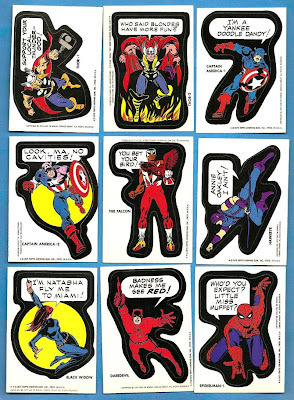 Everyone does it, even superheroes who don't need to (Spidey, Cap, I'm looking at you!). 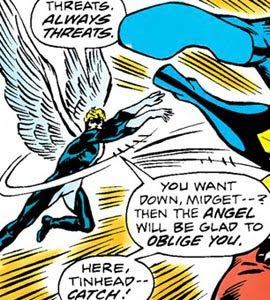 Back in the Groovy Age, costume changes were big deals and didn't happen too terribly often (unless you were a Pym). 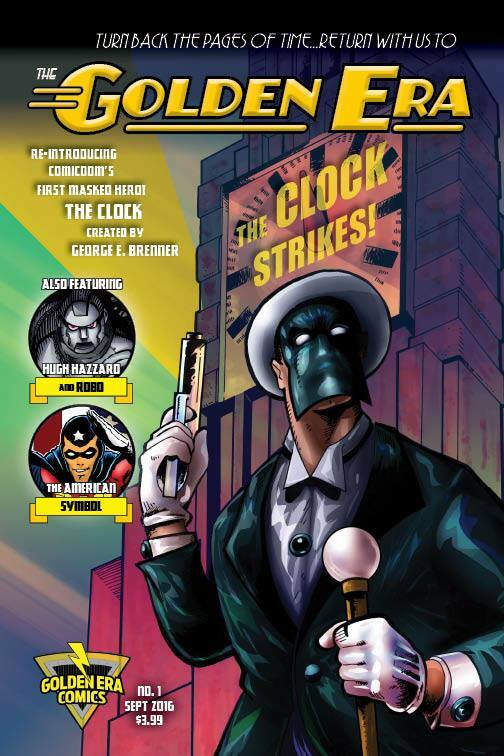 Ol' Groove has done some diggin' to come up with some cool costume changes I hope you'll dig! Dig? I had to lay down some ground rules so I wouldn't overload the whole Internet and make it implode. 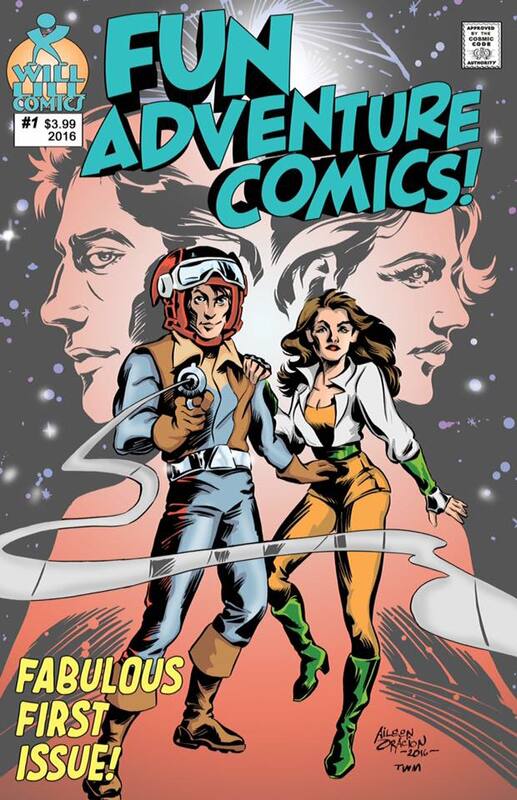 First of all, the costumes I share had to be worn for a few issues; one-shots, flashbacks, and civvies don't count. 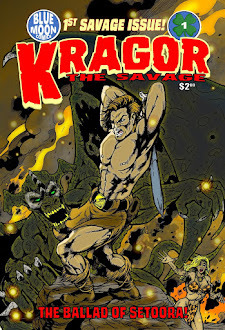 Second, I tried to find pics from the Groovy Age, or at least drawn by certified Groovy Age artists. And finally, I just picked the ones I really, really liked or hated. Don't wanna bore anybody. Got it? Okay, then, let's boogie! 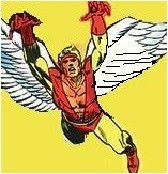 Next is Young Groove's favorite Merry Mutant, the X-Men's very own Warren Worthington III, the Avenging Angel. Naturally, WWIII (hey, Stan, did you...?) 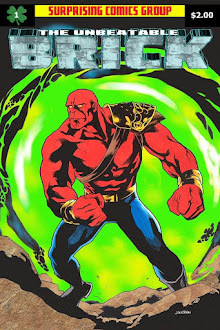 started out his comicbook career wearing his own tailor-made X-Men uniform. 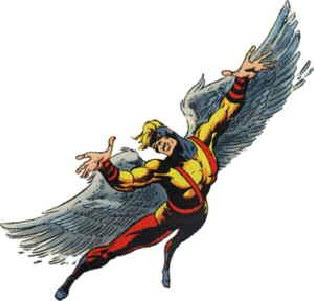 By Champions #8, Marvel had come to its senses and put Angel back in his Neal Adams designed costume, but changed the black and white color scheme to red and gold so our winged mutant wouldn't get lost in the crowd of leather worn by Ghost Rider, Black Widow, and Black Goliath. Whew. Glad I'm just covering the Groovy Age, 'cause WWIII has had lots more costumes. He must be having a contest with the Wasp! 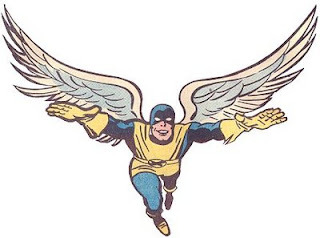 From a hero with wings on his back, we're gonna switch to a hero with wings on his feet. 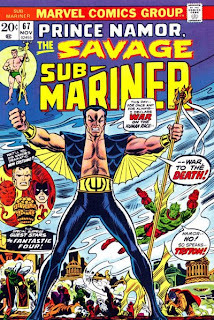 Yeah, the Sub-Mariner changed from his green swimming trunks to a snazzy black ensemble in his sixty-seventh issue. Mystical doctors, rich mutants and unders ea monarchs weren't the only ones who needed a change of threads during the Groovy Age. 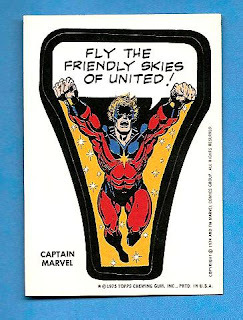 Kree captains, one Captain Marvel, f'rinstance, decided green just wasn't his color and changed to the tried and true blue and red (courtesy the far-out Gil Kane) in CM #17 (the actual change took place at the end of #16, just to level with ya). The Widow's sometimes beau, Hawkeye (or should we call him her "bow"? Ugh, Ol' Groove's puns are reeeeeally bad, aren't they?) traded his classic carny threads for some bodaciously ugly ones when he returned from the Kree/Skrull War in Avengers #98. 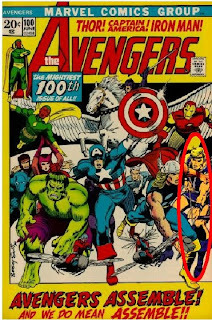 That's him trying to hide behind Thor on the cover of Avengers #100. 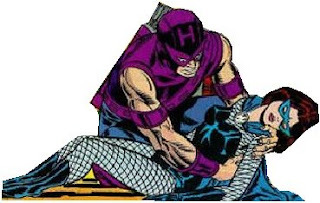 Hawkeye was a good pal of Captain America who had a partner that started off with a hideous costume but wound up with one of the cooler Marvel Superhero uniforms. 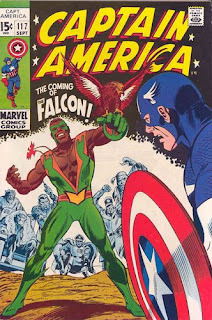 Yep, Sam Wilson, the high-flying Falcon went from fashion don't to fashion do in Captain American and the Falcon #144 (the supremely cool wings were added in ish #171). Whew! Ol' Groove is worn out, Groovesters! I'll stop here, but be back next week when I tackle the costume ch-ch-changes some of DC's characters underwent during the Groovy Age! 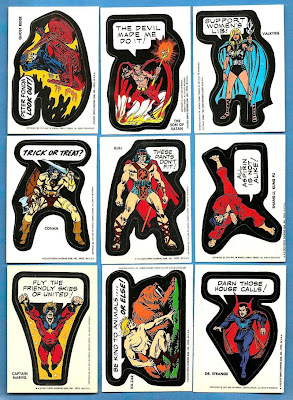 Back in 1973, DC Comics really got Young Groove's hopes up, then dashed them to the ground. 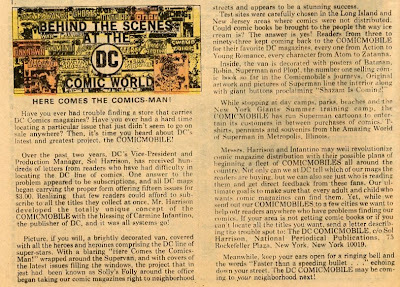 They ran this "Behind the Scenes" piece that summer, claiming that the comicbook world was about to be revolutionized with the introduction of the "Comicmobile"--a mobile comics shop (okay, a van with a dude hawking comics, but still...)! Here, read it for yourself. I'll wait. Didja catch that last line? "Meanwhile, keep your ears open for a ringing bell and the words 'Faster than a speeding bullet...' echoing down your street. 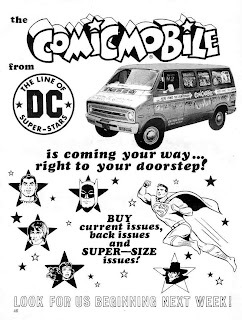 The DC COMICMOBILE may be coming to your neighborhood next!" I spent days, DAYS, I tell ya, waiting outside, listening for that jive bell. But it did exist. 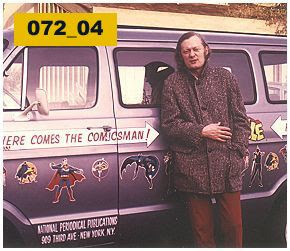 Despite what DC's hype page says, the Comicmobile was really the brainchild of the late comics entrepreneur, Bruce Hamilton (pictured at the top of this post). DC tried it out in select areas, decided it was too costly, and shelved the project. But they never mentioned that fact in their "Behind the Scenes" or even "Direct Currents" pages. I had whole dollar saved up, DC. I had my running legs in shape (practiced chasing the Ice Cream Man, natch). I was ready, man, totally ready. I'm still bummed out about that one. 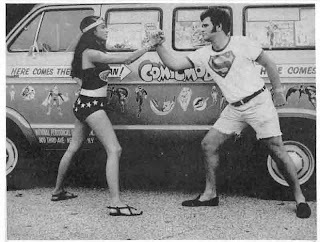 You can read all about the Comicmobile from one of its actual drivers, Bob (the Answer Man) Rozakis right here. 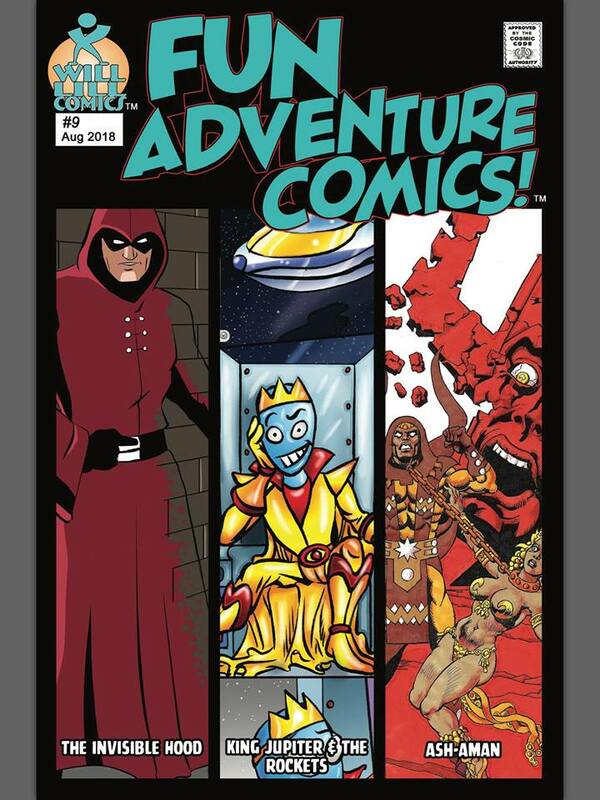 Me, I'm gonna pile a bunch of old comics in the back of my SUV and...naw, in this day and age, a grown man trying to sell comics out of his vehicle would just wind up in the slammer.